KIEV, Ukraine -- From the petty bribes parents must pay to get their kids into school, through to multibillion euro scandals, the former Soviet republic is riddled with corruption. US vice president Joe Biden has never been one to hold his tongue. He certainly didn’t in his recent trip to Kiev. In a speech before Ukraine’s parliament, Biden told legislators that corruption was eating Ukraine “like a cancer,” and warned President Petro Poroshenko that Ukraine had “one more chance” to confront corruption before the United States cuts off aid. Ukraine needs radical reforms to root out graft. After 18 months in power, Poroshenko still refuses to decisively confront corruption. It’s time for Poroshenko to either step up his fight against corruption — or step down if he won’t. The numbers speak for themselves. More than $12bn per year disappears from the Ukrainian budget, according to an adviser to Ukraine’s National Anti-Corruption Bureau. And Transparency International ranks Ukraine 142 out of 174 countries on its Corruption Perceptions Index — below countries such as Uganda, Nicaragua and Nigeria. Ordinary Ukrainians endure paying petty bribes in all areas of life. From vehicle registration, to getting their children into kindergarten, to obtaining needed medicine, everything connected to government has a price. The worst corruption occurs at the nexus between business oligarchs and government officials. A small number of oligarchs control 70% of Ukraine’s economy, and over the years have captured and corrupted Ukraine’s political and judicial institutions. As a result, a culture of impunity was created, where politicians, judges, prosecutors and oligarchs collude in a corrupt system where everyone but the average citizen benefits. A few instances stand out for their brazenness. In one case, $1.8bn of an IMF loan to Ukraine meant to support the banking system instead disappeared into offshore accounts affiliated with PrivatBank which is owned by Ihor Kolomoisky — one of Ukraine’s leading oligarchs. Details have come to light thanks to the anti-corruption group Nashi Hroshi (‘Our Money’). Forty-two import firms owned by 54 offshore entities borrowed $1.8bn from PrivatBank. The offshore firms then used the IMF money to order goods from fictional suppliers, with the $1.8 billion in loans from PrivatBank secured by the goods on order. When the fictional suppliers inevitably did not fulfill their end of the bargain, PrivatBank was left holding the bag with its $1.8bn gone offshore. Unfortunately for Ukrainians — as well as Western taxpayers who fund the IMF — neither Kolomoisky nor anyone else in Ukraine has been held accountable and the case faded from public view in Kiev. First, he needs to immediately fire current prosecutor General Viktor Shokin. The US ambassador to Ukraine recently called out Shokin’s office for “openly and aggressively undermining reform,” and leading reformers in Ukraine’s parliament and civil society continue to demand Shokin’s ouster. 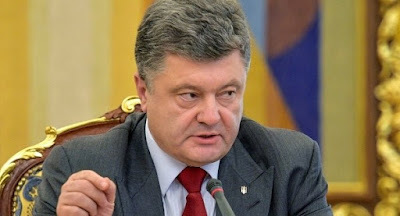 Second, Poroshenko needs to sell all of the assets in his multi-billion dollar business empire. When campaigning for the presidency last year, Poroshenko promised to do just that. He’s the only one of Ukraine’s 10 richest people to see his net worth actually increase in the past year, and his bank continues to expand while others lose their licenses. One of his industrial companies also won a large shipbuilding contract — a clear conflict of interest. Third, Poroshenko must take a hands-on role in the war against corruption. While a new national anti-corruption bureau and prosecutor are in place, they have not started work yet. Anti-corruption activists in Kiev fear both of these organisations will be “eaten by the system,” according to Daria Kaleniuk, executive director of the Anti-Corruption Action Center, a Ukrainian civil society organization. Finally, Poroshenko should replace Yatsenyuk as Prime Minister. Although Yatsenyuk deserves credit for pushing through painful economic and energy sector reforms, he faces corruption investigations as well — not something Poroshenko needs from the second-most powerful official in the country. Ukraine has not completely ignored the fight against corruption. Government procurement tenders moved online and major civil service reform just passed. But the key drivers of these measures are not government officials or politicians, many of who fight these changes tooth and nail, but civil society organizations. Reformers demand radical change, and given the billions of dollars stolen each year by powerful people, they are doing so at great personal risk.